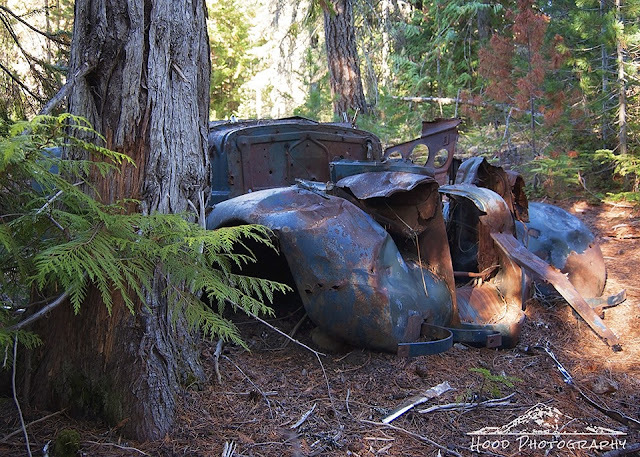 Just north of Trillium Lake, out in the middle of the woods, hides this old abandoned car. A few summers back I had been walking through the woods with my dog and he lead me right the spot where it rests. I visited the car again a few weeks ago when I was there on a camping trip and took this photo of its sad, lonely face. Does anyone know anything about it? I cannot find any information about the old car online. UPDATE: I had a reader suggest that he thinks it is a 1936 Ford Coupe. Thank you for the info! Very interesting photo, but have no clue as to what it is. Maybe aliens landed and left their foot print behind! I love the sun play on the old rusty car. I'm really into rust. I would have probably wear my camera out photographing that wonderful old car. I hope you can learn the history of it. One wonders how many years it's been out there. It looks like it may have been abandoned by Bonnie and Clyde. Mysterious indeed, but a nice photo subject. Maybe abandoned because it was stolen? Maybe it was burned because there was a body in it? OKay... I watch too much television! Curious thing to find in the woods, could be dangerous for adventurous children though! Ah the stories you can make up about that car though. What a treasure. Oh to know the story that is behind it. But, despite the story, you have captured it so well here. I think this shot might be one of my favorites of yours. How cool is that? I love it. I love stumbling upon things like that. Great photo.